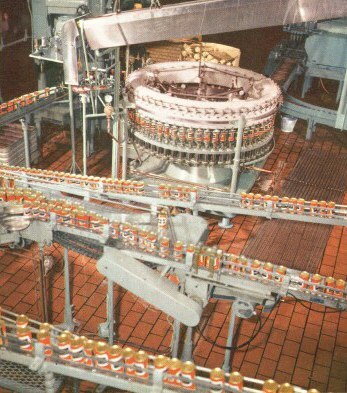 Pictured below are pictures of the inside of Carling's Baltimore, Frankenmuth and Cleveland breweries. I have used these to give you the full effect of the brewing process. 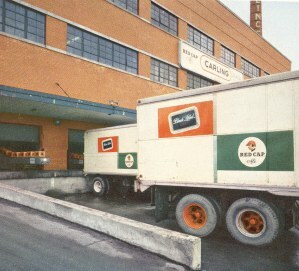 Unfortunately, these beautiful breweries are long gone. However, their memories remain in these pictures. The basic brewing process is the same for both beer and ale. The main difference is in the temperature and the strain of yeast used during fermentation, and the time allowed for each step in the process. The ingredients of beer are malt,cereal grains ( either corn or rice ), hops, yeast, and water. 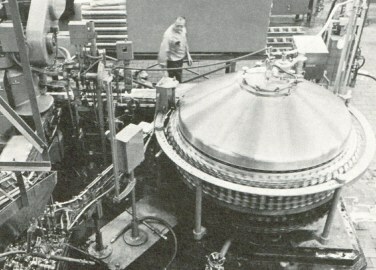 Malt and cereals are moved from storage bins to the whole malt and cereal weigh hoppers. 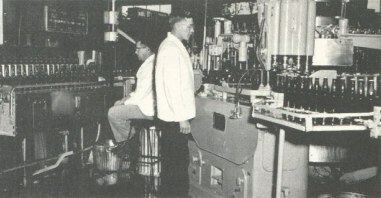 The malt is then crushed, then malt and cereal are then mixed seperately with water at pre-determinated temperatures. 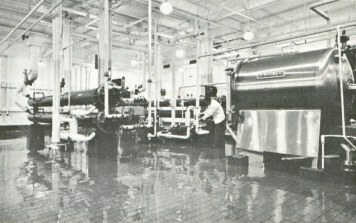 When these water-grain mixtures, also known as "mash", combine under controlled temperatures, the enzymes in the malt are activated and change the cereal starches to fermentable sugars. Next, this mash mixture is strained to separate the insoluble constituents of the grain from a sweet amber liquid called wort. 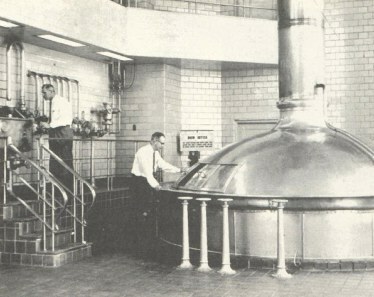 Hops are added to the wort in large kettles and the mixture boiled for several hours. 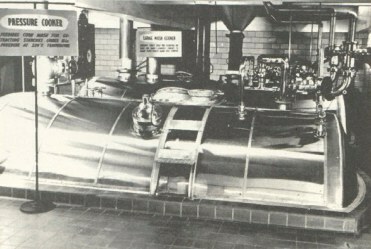 Brew kettle at the Frankenmuth Brewery. 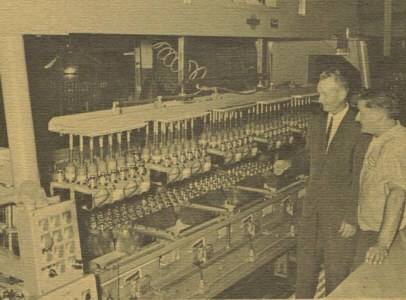 Brewmaster Bill Sherk checking on a batch of Carling. 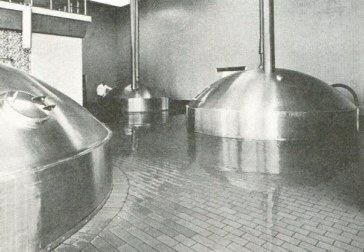 Section of the brew house at the Frankenmuth brewery. Rear is the cereal cooker. 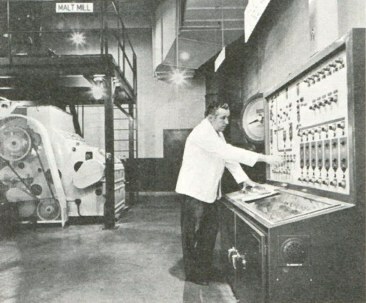 At right is the mash mixer. 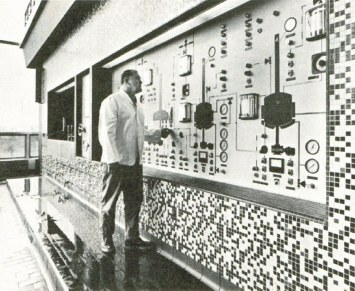 At left is the rear of the brew kettle. After boiling, the hops are removed and the hot wort is cooled and pumped to fermenting tanks. It is here that yeast is added to convert fermentable sugars in the bitter-sweet liquid wort which then becomes the tangy, mildly alcoholic beverage known as beer. 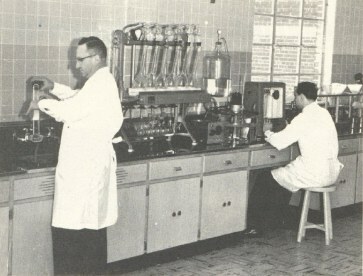 Throughout the entire brewing process, samples of Carling are tested in the QC lab in order to maintain and regulate flavor and consistency. Carbon dioxide is also produced during fermentation and is collected for subsequent use in carbonating the beer. 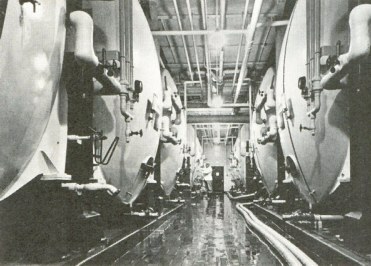 After fermentation, the beer is cooled and transferred to storage tanks to age for a given period of time. 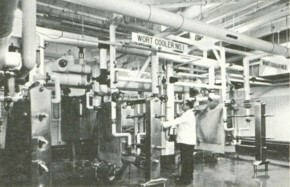 This cold storage period is called "lagering". After initial aging the beer is filtered, carbonated, then aged longer. One final filtering,called polishing, give Carling Black Label its exceptionally clear, brilliant look. Finally the beer is bottled or canned, pasteurized and cooled. 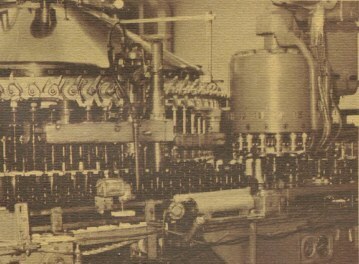 Some of the polished beer is drawn off into kegs and sold as draft beer without being pasteurized. Case filler. 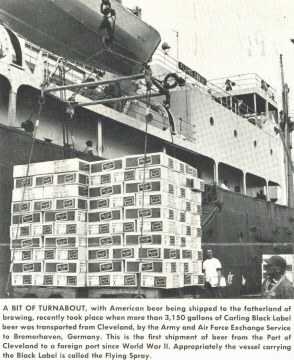 Fact: Carling innovated the 6-pack and case filler! 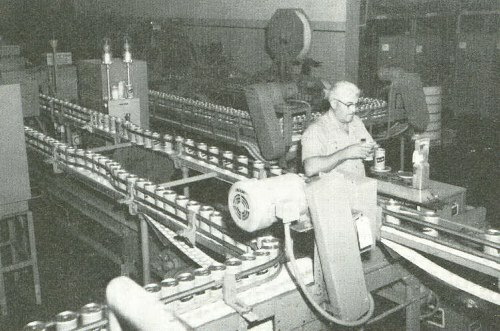 Above is where a production line inspector check behind an x-ray machine that kicks out underfilled cans. 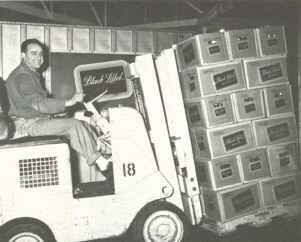 The beer after being packaged into bottles or cans is then packed into 24,12, or 6 pack carriers, then placed into the "mother carton", then shipped to your local distributor for sale. As always, if anyone visiting my site has any pictures to share, please contact me.